Be the first to share your favorite memory, photo or story of Clarie. This memorial page is dedicated for family, friends and future generations to celebrate the life of their loved one. 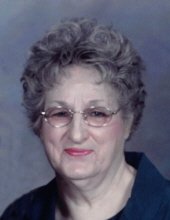 Clarie Ouverson, age 94, of Canby, MN passed away on Monday, April 8, 2019 at the Sylvan Court Nursing Home in Canby, MN. Funeral Service will be 11:00 a.m. on Wednesday, April 10, 2019 at Our Saviour’s Lutheran Church in Canby, MN. Burial will be at the Canby City Cemetery, Canby, MN. Visitation will be held one hour prior to the service at the Church on Wednesday. Houseman Funeral Home of Canby is entrusted with the arrangements. Clariebell May (Olson) Ouverson was born May 1, 1924 in Marble Township, Lincoln County, to Bennie and Bertha (Michaelson) Olson. She was baptized and confirmed in the Lutheran faith and attended many country schools in Marble Township and the Porter area. After school, she worked for a short time at the Deluxe Café in Canby. On October 19, 1948, she married James Ouverson at a Lutheran parsonage in Clarkfield. After their marriage, they lived with Clarie’s folks for a short while before they moved into Canby where they lived out their lives. The two of them rarely went anywhere without the other. To much surprise, in November 1964, God blessed them with the birth of their daughter, Laurie Lace. Clarie was a very devoted wife, a wonderful mother, an impeccable housekeeper, a great cook and made delicious pies, especially for Thanksgiving and Christmas. In 1970 she began selling Avon in Canby and over the course of the next 13 years created friendships with many Canby ladies. In 1983 she and James both retired and they began babysitting in their home. In 1989, they received the greatest gift by becoming grandparents. Together they helped raise their two grandchildren, taught them countless life lessons and an ‘interesting vocabulary’, created many wonderful memories and had a huge impact on who they are today. Clarie is survived by her daughter and husband, Laurie and Mark Thorston of Canby, two grandchildren, Spencer (Becca) Thorston of Good Thunder, MN, and Scarlet Thorston of Jackson, MN and many nieces and nephews. Clarie was preceded in death by her parents; her husband, James; her sister and brother-in-law, Myrth and Ray Van De Veire; niece, Muriel Kirkeide; sisters-in-law and their husbands, Esther and Howard Friedricks, Norma and Charley Ewing, Iona and Junius Dowell, Ardis and Don Johnson, Gladys and Clayton Hasner and Alice and Norman Tesch. To plant a tree in memory of Clarie Ouverson, please visit our Tribute Store. "Email Address" would like to share the life celebration of Clarie Ouverson. Click on the "link" to go to share a favorite memory or leave a condolence message for the family.